The licensee at a famous Edinburgh pub has been named BT Sport’s Manager of the Month for forging close ties with Hearts – despite being a huge fan of rivals Hibs. 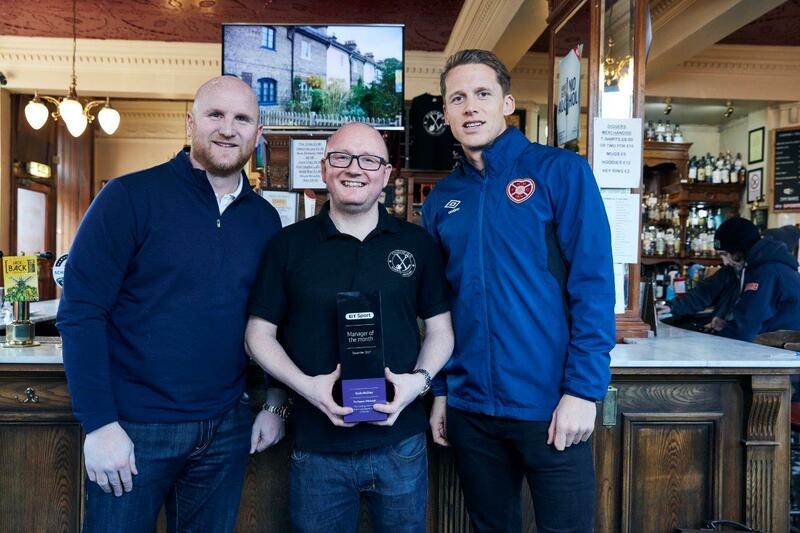 Kevin McGhee, who has run The Athletic Arms, known locally as The Diggers, in Gorgie for eight years, received his trophy from Hearts captain Christophe Berra and BT Sport pundit John Hartson. BT Sport was not only impressed by the community spirit Kevin has helped foster at the Heineken-owned pub but also the links he has forged with the nearby Tynecastle club. Photos and memorabilia adorn the walls of the Victorian pub and fans pour through the doors before and after matches. The pub also sponsors several Hearts players and Kevin – whose uncle Alex McGhee played for Hibs – has held numerous fundraising events for the club. Fans forum Jambos Kickback, who also use The Diggers, recently helped pay for the installation of a defibrillator at the pub. The win at least partially made up for Hearts’ recent 1-0 victory over Hibs in the cup. As well as winning the BT Sport Manager of the Month title for December, Kevin has also won a new 4K TV to further enhance the viewing experience of sports fans at the pub. The nomination process for the January BT Sport Manager of the Month is now under way. Customers can nominate licensees and managers they think are worthy of winning by tweeting @BTSportBars using the hashtag #BTMOTM.